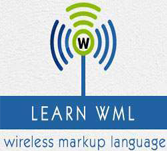 what is WML <p> Tag? The <p> element provides a paragraph of text and WAP browsers always to create a paragraph in a new line. A <p> element is required to define any text, image or a table in WML. This is used to change the horizontal alignment of a paragraph. Sets whether a paragraph should wrap lines or not. Following is the example showing usage of <p> element.